Maize is Zimbabwe’s most important food staple, but traditional and conventional storage practices do not protect against major pests and pathogens. Up to 20-30% of grains are lost due to storage conditions, and tests of harvested maize in Zimbabwe have revealed significant levels of contamination by aflatoxins. These naturally occurring toxic substances can severely affect human health when they are consumed, with babies also at risk through their mother’s breast milk. In young children, aflatoxins can cause stunting, poor cognitive development, and greater susceptibility to infectious diseases. Aflatoxins also cause liver disease and cancer, and contribute to immune system suppression in both humans and animals. Although various technologies have been developed to reduce post-harvest losses, their effectiveness in reducing aflatoxin contamination in grain and exposure in humans is poorly understood. This project investigated the efficacy of new storage technologies in meeting these objectives in the Shamva and Makoni districts of Zimbabwe. The project used a randomized control trial to test the efficacy of two hermetic (airtight) technologies — metal silos and thick plastic “super bags” — against conventional storage methods such as polypropylene bags and mud huts. Households selected from 12 wards in the Makoni and Shamva districts were randomly assigned to either an intervention group that used the new technology or a control group that used conventional storage. 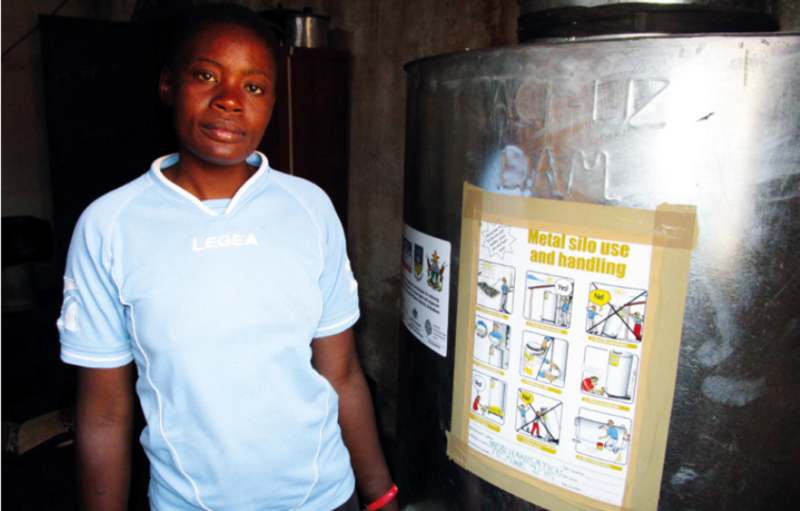 In conjunction with the Department of Agricultural Mechanization, 12 artisans were trained to fabricate the metal silos, which were distributed to farmers in the intervention group. Researchers assessed the extent of aflatoxin contamination in grain using both types of storage on a quarterly basis for two seasons. Aflatoxin exposure in mothers and children was assessed through a quarterly analysis of aflatoxin M1 as a biomarker in urine samples and breast milk. A total of 941 farmers (594 women, representing 63%) were trained on post-harvest management and on how to use and handle hermetic technologies. These trainings have increased farmers’ knowledge of good farming practices, which in turn will increase agricultural productivity. The results showed that the occurrence and levels of AFB1 in hermetic storage were less than in conventional storage facilities. This demonstrated that hermetic technology is more effective at preventing the development of aflatoxin B1 (AFB1) in stored maize than conventional methods and can therefore be used to reduce economic loss due to insect damage. The average maize grain weight loss due to insect contamination was 6.11% for conventional storage, 3.54% for metal silos and 2.54% for hermetic bags. Training farmers in effective pre- and post-harvest practices was also effective in minimizing aflatoxin contamination of grain. For example, drying grain on the bare ground was reduced from 61% at the start of the project to 2% at the end. The analysis of economic loss when using the improved post-harvest technologies indicates that in fact, hermetic technologies increased incomes. Households can safely store their produce after harvest when there is a surplus and sell it when prices are good during the lean period. During the lean period, a 20 kg bucket of maize grain stored using conventional methods sells at US$4.00- 5.50 (CA$5.37-7.39), while the same amount of maize stored using hermetic technology sells at US$7.00-7.50 (CA$9.39-10.07). Male and female household members showed increased collaborative partnerships when carrying out pre- and post-harvest tasks at the household level. For instance, in baseline studies, 68% of respondents stated that maize de-husking was carried out by both men and women. This percentage increased to 92.5% in an endline survey. Farmers using hermetic metal silos to store maize have seen a reduction in loss of quality in the grain. The introduction of hermetic technology is saving women time and labour by removing the need for chemical protectant application to control insect infestations, and subsequent maize cleaning prior to milling. Although the levels of aflatoxin exposure to humans increased with increasing storage time of the harvested crops, results indicated a lower occurrence and concentration of aflatoxin M1 in the urine samples of women and children from households that used the hermetic technology, compared to the urine samples of women and children from households using conventional storage facilities. Awareness of aflatoxins and their associated health risks increased among women from 36% in a baseline study in 2015 to 99% at the end of the project in 2016. Interactions with the Ministry of Health during the development and implementation of the research project resulted in the inclusion of a mycotoxins component in the 2015 national survey on rural livelihoods by the Zimbabwe Vulnerability Assessment Committee. Upon the project’s completion, results were presented in June 2017 to Zimbabwe’s Ministry of Agriculture, Mechanisation and Irrigation Development (MAMID) and the Ministry of Health and Child Care (MOHCC), where policymakers, government researchers, agronomists, and engineers were in attendance. Ministry directors have invited the research team to deliver another presentation to higher management so that a way forward can be mapped on mycotoxins in Zimbabwe. MAMID and MOHCC realized that there is a need to include mycotoxin information in the training manuals of Agritex extension workers, who equip farmers with information and knowledge on agricultural practices to increase productivity. It is envisaged that the project will directly contribute to better policies to govern pre- and post-harvest management, as well as mycotoxin regulations in Zimbabwe. The research has contributed to Zimbabwe’s Agenda for Sustainable Socio-Economic Transformation, in which the Government of Zimbabwe is aiming to, among other goals, improve storage of harvested crops and food quality. The analysis concluded that hermetic technologies are better than conventional methods and can therefore be used to reduce economic loss due to insect damage. It is recommended that training and education on good pre- and post-harvest management practices, and health risks associated with consumption of food contaminated with aflatoxins, be institutionalized by relevant government ministries.